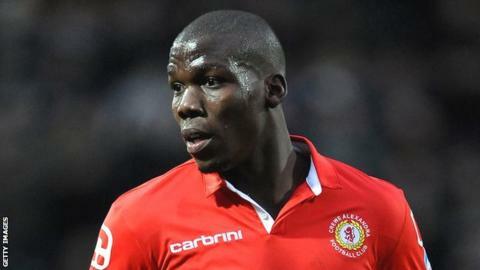 Crewe Alexandra striker Mathias Pogba is hoping to return to full training this week for the first time since injuring his knee in pre-season. The 23-year-old, who joined Crewe from Wrexham, was the club's leading scorer last season with 16 goals. Alex manager Steve Davis told the club website: "Pogs has joined in the running and will have some involvement in the football this week. "But we will be very choosy about what he does." There is also positive news concerning fellow forward Ryan Colclough, who last appeared as a substitute in the 2-1 defeat by Port Vale on 23 November. "Ryan is over the chest infection that has been with him for nearly four weeks," Davis added. "It will be great to have those two back, it will be like having two new signings." Crewe are currently 22nd in League One, but ended a run of four successive defeats in all competitions with a 1-0 victory over Crawley last Saturday.